Since opening in 1963, The Whitehall has made a name for itself as a landmark destination among downtown Houston hotels. This Classic Revival hotel, with its famed Italian marble floors, was designed by renowned Los Angeles architectural firm, Welton Becket and Associates. 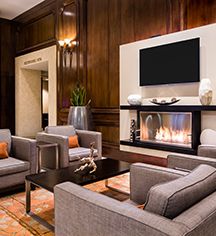 Now beautifully refreshed, yet remaining true to the hotel’s rich history and design, The Whitehall welcomes guests to an unmatched Houston original, immersed in authentic service and downtown’s vibrant local culture. The Whitehall recently completed a total transformation of its guestrooms, public areas, and on-site eateries. The 259 meticulously renovated guestrooms feature Sotherly’s Signature Beautyrest ® mattresses, Olive Branch Botanicals bath amenities, and complimentary signature “Sothern Delights” cookies. With three convenient and authentic on-site dining options, guests can enjoy Tex-Mex with a Southern flair at Edgar’s Hermano, enjoy a freshly brewed cup of java at the Buffalo Bayou Coffee, or a refreshing cocktail at the outdoor restaurant and bar, Part & Parcel. With numerous luxurious amenities such as an outdoor rooftop pool and a 24-hour fitness center, guests can enjoy an unforgettable Houston experience with the perfect blend of sophistication and Southern charm. The Whitehall’s coveted location in Houston’s Central Business District is the perfect starting point for exploring the city’s hidden gems and can’t miss attractions. The hotel is just a short stroll to the Theater District, sports arenas, and eclectic shopping, as well as Houston’s trendiest restaurants and bars. Business travelers will appreciate the proximity to the George R. Brown Convention Center, connection to Houston’s major corporations via skybridge, and the Downtown tunnel system. The Whitehall’s friendly staff is ready to help guests experience Houston like a local, with insider information and complimentary shuttle service to all downtown Houston destinations. Celebrated for its genuine Houston hospitality and distinctive design, The Whitehall remains the city’s premier choice for business and leisure travelers. Elvis Presely stayed at the hotel in 1974 prior to his performance for the Houston Livestock Show and Rodeo at the Houston Asrodome. Cancellation Policy: 24 hours- 6PM day prior to arrival. Deposit: Must have a valid credit card on file for reservation.Full authorized payment due at time of check-in. Pre-pay for first night's room and tax. Hotel/Resort Fees & Taxes: Taxes: 17%. Occupancy Restrictions: Max of 5 occupants. Shuttle Service: Area shuttle may be scheduled through the resort's concierge. Rates apply. 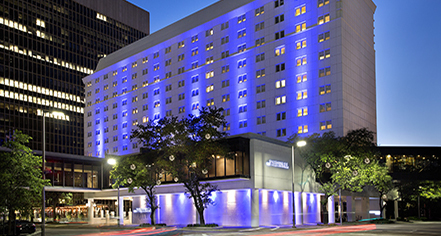 Since opening in 1963, The Whitehall has made a name for itself as a landmark destination among downtown Houston hotels. This Classic Revival hotel, with its famed Italian marble floors, was designed by renowned Los Angeles architectural firm, Welton Becket and Associates. Learn more about the History of The Whitehall .